Refreshing like a fruit salad. Hearty like a chicken salad. This Fruited Chicken Salad is both—and sprinkled with toasted almonds to seal the deal. Mix cream cheese and mayo in large bowl until well blended. Add all remaining ingredients except almonds; mix lightly. Spoon onto lettuce-covered plate, if desired; sprinkle with almonds. Serve with saltine crackers or RITZ Crackers. 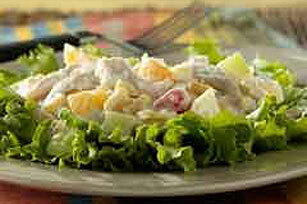 Make use of leftover cooked chicken in this delicious salad, perfect for a Sunday morning brunch. This chicken salad makes enough for 8 people. Prepare as directed. Cover and refrigerate up to 24 hours before serving. To easily shred chicken for use in recipes, place cooked boneless skinless chicken breasts on a cutting board. Use two forks or your fingers to pull the meat apart in opposite directions to form long shreds. Substitute MIRACLE WHIP Dressing for the mayo.